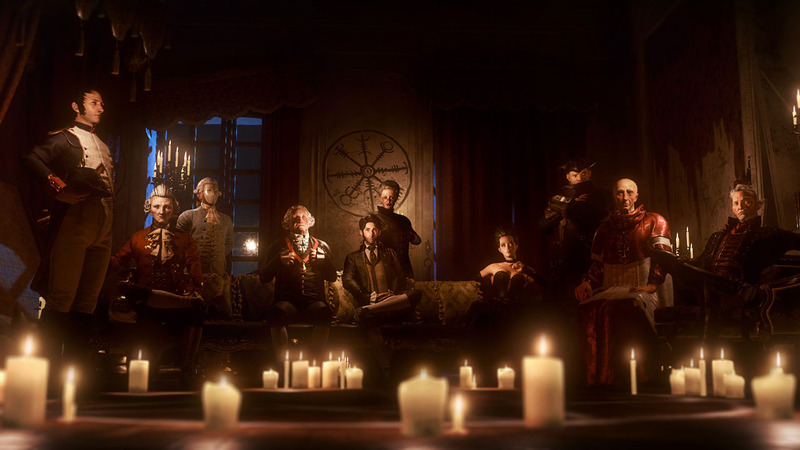 The Council is a newly-released episodic with a focus on narrative from developers Big Bad Wolf and publishers Focus Home Interactive. The first episode, The Mad Ones, was released on March 13th and serves as the introduction to The Council’s world and characters. You pilot Louis de Richet, a young French aristocrat, as he attempts to find his mother, who has gone missing on a private island where dignitaries from all over the world mingle. Throughout gameplay you will earn skills and unlock abilities that help you do verbal battle with the other visitors on the island, and discover the truth about your mothers whereabouts. The Council opens with a scene where Louis and his mother are tied to a chair being interrogated, and immediately — within the first few lines spoken — The Council starts to disappoint. French aristocrat Louis de Richet and his French aristocrat mother both speak with modern American accents and their captor talks like he’s from Badguy-istan. The issue is not confined to the first scene either, with Spanish oligarchs speaking in English accents and George Washington (yes, that one) speaking in a modern dialect. Poor choice of accents aside, the voice acting is also exceptionally bad. Lines are spoken without character or feeling, and what affect is present is usually wrong for the scene. The narrative-driven nature of The Council means that someone is always talking, so the bad voice acting is front and center for the length of the game. This bombardment induced in me a range of emotions from amusement to blind fury, even though it’s difficult to deduce whether the poor voice acting is due to common incompetence, or if the actors were struggling to take their lines seriously. Unlike the voice acting, the dialogue is more perplexing than infuriating, but all the same it detracts greatly from the experience. 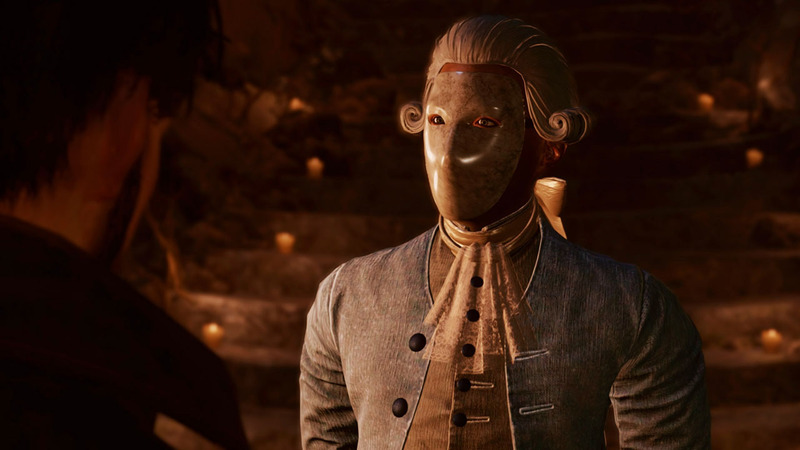 The Council was created by a French development team and originally written in French. The translation into English doubtlessly removed any subtlety from the character's lines, oftentimes making them seem strange. Characters blurt out their feelings and intentions instead of suggesting them like an actual person would, and Louis’ inner monologue makes him seem like a dullard, as he restates extremely obvious conclusions and asks questions that have already been answered. Conversations with other characters in The Council are disjointed, such as one line of dialogue having nothing to do with the next, and characters often “forgetting” what you tell them from conversation to conversation. Everything is so unnatural that it’s impossible to suspend your disbelief as a player. But, like the voice acting, perhaps the dialogue is an effect of a larger problem. For a narrative-driven title, The Council’s narrative is very thin. It boils down to searching for your missing mother, and your membership in a super secret organization. But you’re never given the chance to invest in the elements of the story. Your mother is on screen for five minutes before she disappears (and it’s an underwhelming five minutes), and the rest of the game is spent trying to find a person that you don’t really care about. You know that Louis and his mother are part of a secret organization, but so is everyone else on the island, and no one mentions what the organization is for. Are they crime fighters? Ghostbusters? Rich people fetishizing the occult? It’s impossible to tell. The Council’s gameplay is on par with other narrative games, and the RPG elements are a nice addition to the formula, but end up meaning little in the scope of things. You can always work around not having a skill, so you don’t have to think about what you invest in. The graphics are overly stylized to the extent that all of the characters look like victims of a lab accident, but that does add to the general “creepy” atmosphere. The game is not very stable, crashing at loading screens and suffering from several graphical glitches throughout its course. Several problems were fixed at launch, but others persist.